Despite the seeming simplicity of the device, it is rather difficult to decide how to choose a spray gun. 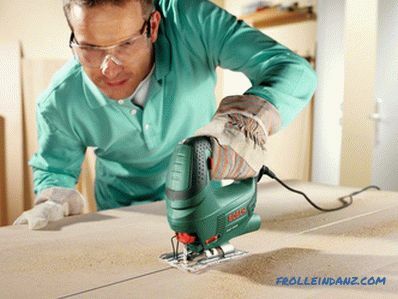 Not so long ago, this task was a little easier, because only pneumatic devices were present on the market, but now electric ones have also been added - with their own advantages and disadvantages. In order to make the right choice between them, you need to know their structure, principle of operation, scope of application and clearly imagine for what purpose they will be purchased. The very name of this type of spray gun implies the use of compressed air during their work, therefore a compressor will necessarily be present in the design of the entire device ( mostly with electric motor) with receiver. 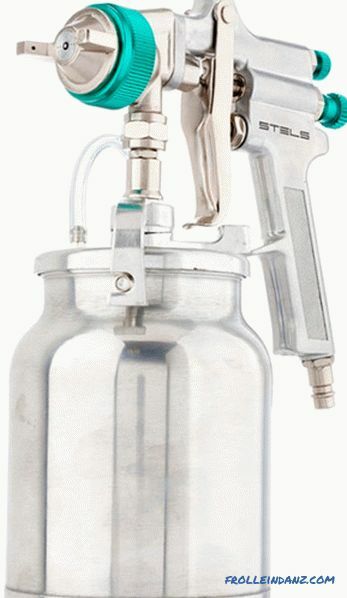 The spray gun itself is a pistol-shaped spray nozzle, at the top or bottom of which a paint tank is attached. The receiver with the sprayer are connected by a rubber flexible hose, through which air is supplied under pressure. Also paint is supplied to the sprayer, which is broken by a stream of compressed air into the smallest particles and blown out of the nozzle of the pistol. Its shape is made in such a way that the flow of air and paint is not straight, but forms a so-called torch, diverging at a certain angle to the sides. 12. Fitting for hose connection. For such a device to work without failures, its components must be made of high-quality materials and precisely matched to each other. All this affects the final price, so the pneumatic spray guns are mostly used by professionals. 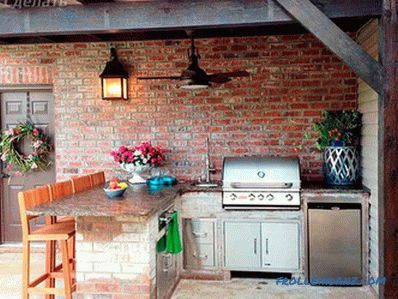 There are a lot of controversy about whether to choose a spray gun or compressor first. You can bring different arguments, but the most correct thing would be to choose a pistol-spray gun, depending on the type of work planned, and then to pick up a suitable compressor. spray gun. 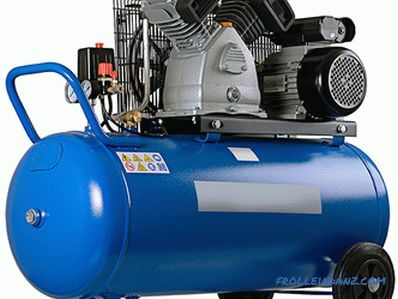 The spray gun can be equipped with one of three paint application technologies, differing by the working pressure and the volume of air required for this, which the compressor must produce. The technology used is directly displayed in the abbreviations of the names of spray guns - HP, HVLP, LVLP. Each of them in its own way copes with the main drawback of pneumatic spray guns - the formation of the "paint fog". It appears due to too much grinding of paint particles, which become very light, and on the way from the nozzle of the pistol to the surface to be painted, it is simply slowed down by air and remains in it as a suspension. 1 HP (High Pressure) - high pressure . A high percentage of paint that does not fall on the surface to be painted is about 50-55%, and This is a tangible waste of paint and varnish materials, plus high air pollution. It is necessary to buy paint more often and to change respirators with protective suits - an obligatory attribute for such works. High air pressure requires skills to use such equipment - if you bring the pistol nozzle too close to the surface to be painted, the air flow will simply inflate the already applied, but not yet frozen paint. Although the spray gun using HP technology is notable for its low cost, but the need for high pressure and high air flow require a sufficiently powerful compressor. 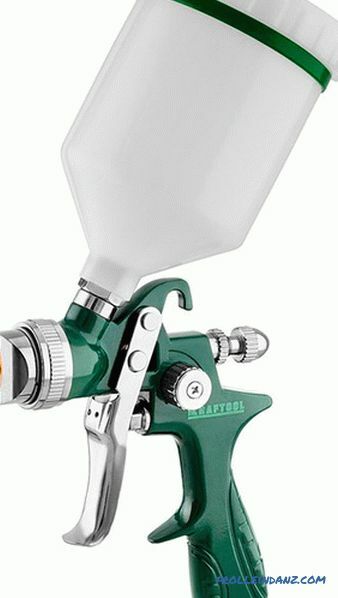 If you do not pay attention to the issue of efficiency, high-pressure spray guns are inexpensive and versatile devices that can be used in the vast majority of types of paint and varnish works. 2 HVLP (High Volume - Low Pressure) - large volume of air, low pressure . The nozzle of the gun of such a spray gun is designed so as to lower the high pressure from the compressor at the outlet. Accordingly, the paint, though flies out at a slower rate, but in greater quantities per unit of time. Since the air flow is lower, this allows you to keep the gun closer to the painted surface, on which more paint falls, due to which the loss of paints and varnishes are reduced - the transfer coefficient can be over 65%. Such devices are noticeably more expensive than high-pressure spray guns, but saving paint in excess of 15% allows them to pay for themselves fairly quickly. 3 LVLP (Low Volume - Low Pressure) - small volume of air, low pressure . Premium class devices, with a transfer coefficient of up to 80%. This technology does not require the presence of a high-pressure air pistol at the inlet, respectively, and a powerful compressor is not needed - it is enough that it produces about 200 liters per minute. It would seem that with a lower air pressure, the speed of work should fall, but this does not happen due to a higher transfer coefficient. The quality of painting under such conditions only increases, since less control is required over the distance from the gun to the surface to be painted. Although LVLP spray guns are the most expensive, but they are indispensable devices when working with lacquer coatings of the premium segment. Even if the paint savings increase by only 5-10% compared with HVLP, with regular work, the purchase will justify itself quickly enough. Depending on the density of the paint, its viscosity and graininess can use nozzles with outlet diameters from 0 , 8 to 7 mm. Also, this size depends on the size of the painted part - for example, in the ship repair industry or in car building, the ability of the spray gun to apply paint to a larger area comes to the fore. Many manufacturers make spray guns with replaceable nozzles, but completely monolithic tips for one size are not uncommon - the same professional devices for painting ships are unlikely to need additional nozzles for nozzles. The diameter of the nozzles of professional devices is selected depending on the colors with which most often have to work, and the size of the painted parts. For domestic needs most often need nozzles with nozzles with a diameter of about 1.5 mm - they are suitable for the vast majority of varieties of paints, representing a reasonable compromise between the speed and quality of painting. As a result, if the set of additional nozzles does not particularly affect the price, then it is silly to refuse to expand the functionality, but otherwise it is worthwhile to estimate how much they will be in demand. 1 Plastic or metal . Here it is necessary to take into account such nuances as the weight of the tank and its transparency. It depends on the first one how much faster the hand will get tired during long-term work, and on the second - control of the level of the remaining paint. According to these indicators, plastic containers are unambiguously leading, and sellers say that they account for a larger percentage of sales. However, metal also has a customer — sometimes the strength requirements outweigh the rest. 2 Top or bottom location . When the tank is on top, the paint is supplied to the gun by gravity, and at the lower location it is drawn in by the air supplied from the compressor. Placing the tank on top or bottom does not give any improvement in the quality of painting, so only the convenience of work will affect the choice between them. When the container is fixed on top, the gun will have a slightly better weight distribution, but during breaks in work you will have to think about where to put it. When the tank is located below, it forms its own pedestal, plus if you often paint walls near the ceiling, or surfaces with similar configuration, you can raise the spray gun higher. Each manufacturer can equip spray guns with various adjustments, the presence and number of which are not regulated by anything. 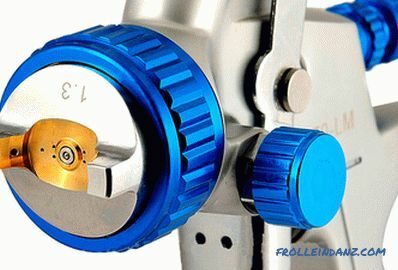 It is mandatory to install the needle stroke regulator, which determines the amount of ink supplied. Also can be installed limiters the amount of air supplied, adjust the shape and size of the paint torch, as well as additional adjustments that may affect the process of painting in different ways, depending on the paints and varnishes used. 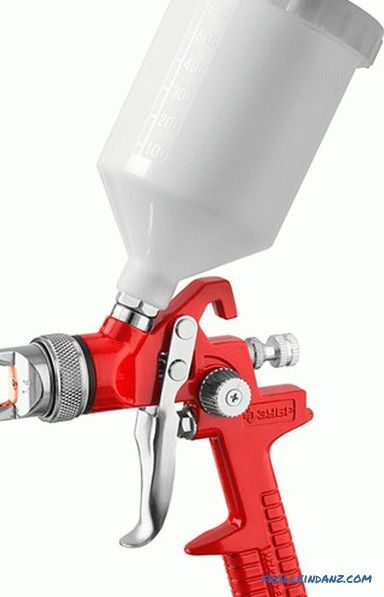 If the characteristics of a spray gun in a lot determine the quality of painting, then everything else depends on the compressor: will the gun get the required amount of air with the right pressure and how long will it work endless. The main task of this device is to equalize the outflow of air (the pump gives it jolts) and to accumulate the necessary pressure. There is a directly proportional relationship - the larger the volume of the receiver, the more stable the air flow and the longer the compressor engine will rest until the pressure decreases. On the other hand, a large receiver will gain the right pressure for longer. 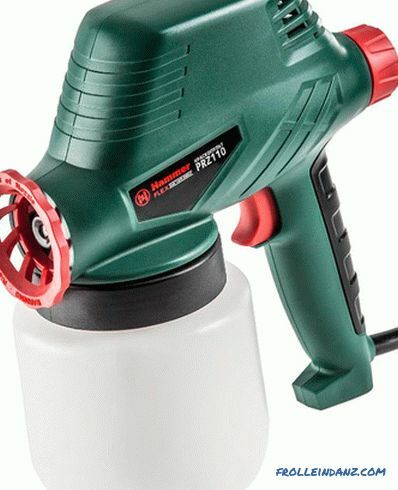 A receiver with a volume of 25-50 liters is quite suitable for using spray guns at home - this is the golden mean between compactness, performance and frequency of inclusions during continuous operation - even painters-professionals will have that amount. A larger receiver volume — 100-500 liters — may be needed just to keep production lines operating. If you have doubts about the correctness of your choice or you just need a reserve for the future, then you should pay attention to the presence of a connector for connecting an additional receiver - they are often installed in case you need to increase the working volume. The overwhelming majority of budget and semi-professional compressors are equipped with electric motors of about 1.3 kW - with a receiver volume of up to 50 liters, this is more than enough to maintain a working pressure of up to 6 bar. At the same time, in the store you can see two seemingly identical engines, but one shows a power of 1.3 kW, and the other is 1.8 or 2 kW. Of course, there is a temptation to think that a more powerful engine is better - it will pump air faster, just more reliable, and the seller will most likely say the same thing. But here we must understand that theoretically it is possible to increase the power of the engine due to the quality of the winding, but basically, the more powerful it is, the larger its size. To verify the veracity of the words of the seller, it is enough to look at the pumps of these compressors - if they are the same in size, it indicates the marketing insights of the manufacturer with almost 100% probability. The fact is that power has no relation to the rate of air injection - it all depends solely on the size of the piston and the number of revolutions of the engine shaft per minute. If the pumps (pistons) are the same, then for a significant increase in the rate of air injection requires a corresponding increase in speed. 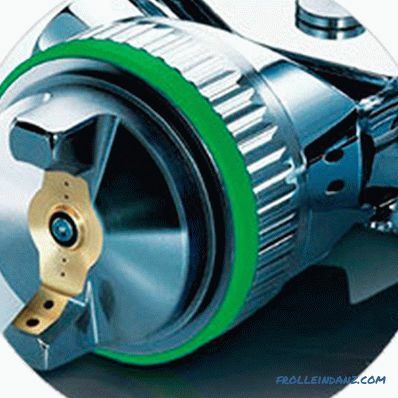 Even if the seller insists on the version of the super engine model, then we must remember that a large number of revolutions is proportional to the rapid wear of the bearings and the piston group. As a last resort, a full-scale experiment will put all the points on the “i” - you just need to blow the air off the receivers, check the time of their filling, and then decide whether the overpayment is worth the promised benefits. A pressure switch is installed on each receiver, at which the required values ​​are set at which the engine is turned on and off. In compressors used for paint work, most often the lower bar is 6 bar and the upper bar is 8. This means that when the receiver is less than 6 bar, the engine turns on and pumps air until the pressure rises to 8 bar. The need for more pressure occurs only when using compressors in production. As in the case of engine power, there was some marketing delicacy, so special attention should be paid to this parameter. The fact is that there are two types of compressor performance - the amount of air that it pumps into the receiver from the environment and the volume blown out by the gun. The manufacturers, without a twinge of heart, indicate in the characteristics the amount of air that the pump drives through itself, keeping silent about the inevitable compression losses, which reach up to 35%. Accordingly, in order to get the real figure, you need to multiply the passport by 65% ​​(* 0.65). That is, if in the characteristics of the compressor the performance is 200 liters per minute, then the spray gun of them will receive 200 * 0.65 = 130 l / min. You also need to take into account some stock, to which manufacturers of spray guns recommend to allocate about 15%. For example, the spray gun needs 200 l / min, then the calculations will look like this: (200: 0.65) + 15% ≈ 307.7 + 46.15 ≈ 355 l / min. If you take a compressor with a lower capacity, then either the pistol will not have enough pressure and you will have to make long pauses in the work on air re-injection, or the engine will work practically without interruptions, which will accelerate its wear without the right to warranty repair . As a result, compressor performance is one of the most important characteristics and must be selected with a margin, taking into account the possibility of connecting additional equipment besides the gun itself. 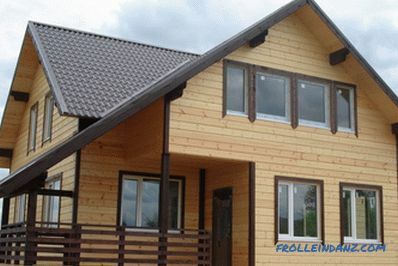 Some of the additional functions must be present, and the availability of others depends on the manufacturer. The first are the safety valve, which will bleed off excess air when the pressure switch fails, and a circuit breaker that shuts off the engine when it is overloaded. 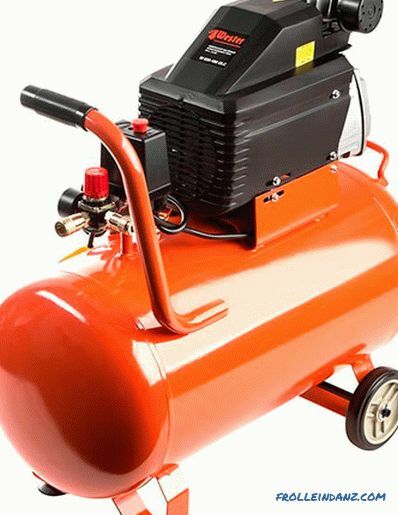 Additionally, the compressor can be equipped with a pressure regulator, a pressure gauge and air filters. 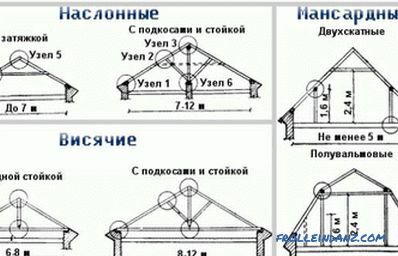 Since the mass of the engine with the receiver is large enough, we must look at the presence of wheels and overall ergonomics - how convenient it will be to move the compressor from place to place. As a result, the choice of compressor is reduced to a number of simple calculations, but they must be done correctly - otherwise you can get a device that does not meet all the expectations. The varieties of electric spray guns are quite different from each other in terms of their principle of operation and form factor, therefore, you can decide which spray gun to choose exactly known front of work in which it will be used. Structurally, an electric airless spray gun consists of a nozzle, a valve, a cylinder, an electromagnet, an oscillating rail and a piston. 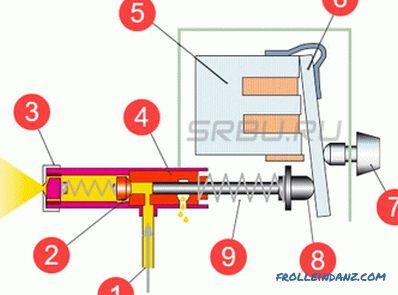 The principle of operation is as follows: an oscillating bar pushes the piston forward, and back it returns under the influence of a spring, when the piston moves backward, a rarefied space is formed in front of it, where paint is sucked in, and when moving forward, the paint is pushed through the nozzle outwards. Since a large number of oscillations and strokes per second are made, a continuous supply of paint is created. When using this technology, it is impossible to obtain sufficiently small drops of paint - in this parameter even the low-cost pneumatic spray gun wins by a large margin. The advantages of an airless airbrush in its overall compactness, unpretentiousness and relatively low cost, which makes it a good helper in living conditions. 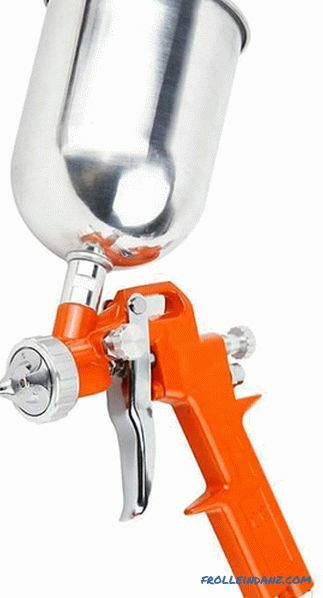 The principle of operation of an airless spray gun allows you to get the torch of the correct shape with clear outlines and use even high-viscosity paint and varnish materials for work. The characteristics of airless devices determine their scope of application: for any work in domestic conditions and when it is impossible or impractical to use pneumatic spray guns, for example, when applying viscous compositions. Such devices are difficult to unambiguously refer to pneumatic or electric - rather, it is a hybrid that has taken all the best sides from both types of spray guns. This is a standard design, which works on the principle of forcing pressure into a container of paint, which then passes through the tube and is sprayed through the nozzle of the gun. 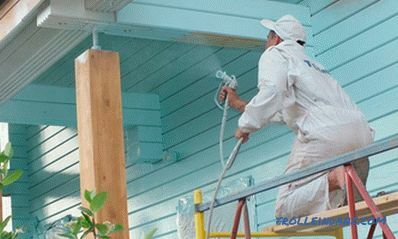 From the pneumatic spray gun, here is taken a method of applying paintwork materials, which are broken by the air flow and applied as thin as possible. However, there is a mini compressor designed for a pistol. A big plus of such devices is the possibility of alternately using one spray gun for different types of paints and varnishes. 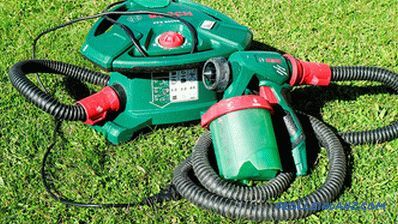 The drawbacks of air electric spray guns are the same as those of pneumatic airbrushes - the occurrence of a paint mist during operation, with appropriate restrictions. 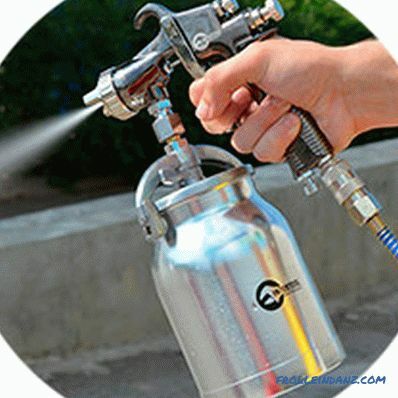 Such devices are divided into spray guns with built-in compressor and remote. Spray guns with built-in compressor have a small size and low price, but are suitable for performing only those works where high quality coating is not required. 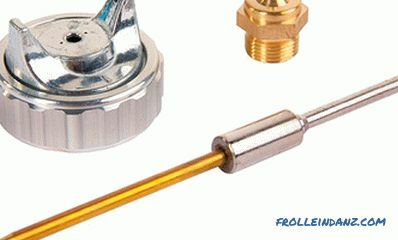 Devices with a remote compressor are more expensive, but they are more convenient in operation, since the supercharger is located separately and is connected to the gun through a hose. Such devices provide a fairly uniform supply of paint and have a number of adjustments, which makes it possible to achieve good covering and quality of dyeing. In essence, these are the same hand spray guns, divided into a gun and a pump for paint, but of large size and with characteristics close to professional tools .They are equipped with a powerful electric motor and a pump, which are mounted on a separate mobile platform, and painting is done with a separate spray gun connected to the pump with a high-pressure hose. Paint is supplied from the included reservoir or directly from the bucket into which the hose is inserted. 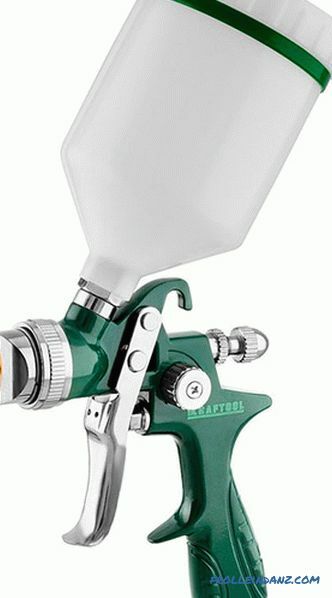 This spray gun has a large number of different adjustments, which allows you to configure it to work with any kind of paint and apply it on an industrial scale and in various areas of production. This parameter determines the speed of the entire device - low-end models produce about 0.5 l / min, middle-class spray guns - from 0.8 to 1 l / min, and floor painting stations can spend more than 2 l / min of paint. Depends on the type of pump that supplies paints and varnishes. Most electric spray guns are universal, but there are some varieties of them that are designed to work only with water-soluble compounds. Since in most manual models the tank is mounted on the gun and it is necessary to keep it on weight during operation, it is rare when the capacity for paint with a volume of more than 1 is used, maximum 1.5 liters . In the floor painting station the tank may not be - instead there is a place to install a bucket of paint. Usually it is metal or plastic - most often buyers prefer the second option, since such a tank is easier and the level of the remaining paint can be seen through its walls. Since the electric spray gun is suitable for work with a large number of paint coatings, for their various varieties you need a nozzle of its diameter. For standard enamels, the maximum nozzle size should be no more than 1.3 mm, for acrylic compositions - up to 1.6 mm, and a nozzle with a diameter up to 2.8 mm will be suitable for primers. It helps to paint ceilings and other hard-to-reach places that you would otherwise have to travel by stairs. Determines how far you can move away from the compressor if it is a spray gun with separate blocks or an entire painting station. When purchasing a long hose, it is necessary to take into account how far the paint can "push" the pump with the engine. Manual models often cost the most necessary minimum — by adjusting the amount of paint supplied and the shape of the torch. Models with a remote compressor are closer to professional in performance: several spraying modes, adjusting paint pressure at the gun exit, the ability to change the piston speed - they clearly gain in the number of adjustable parameters. Although the electric spray gun is a rather complicated device, it is very difficult to find spare parts for it - especially for budget models - therefore, if it is seriously damaged, it is easier to replace than repair. When buying it is worth once again to make sure that it is made of normal plastic, all the parts fit together and do not play anything. The “buzzing gun” can vibrate quite strongly during operation, which is why the hand will be tired more quickly and the quality of painting will deteriorate. 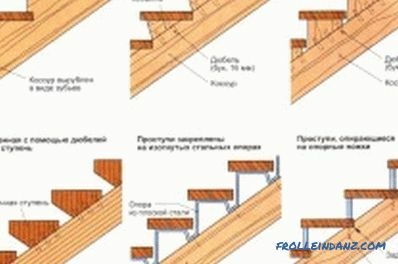 You can check the level of vibration only by comparing the work of several devices. 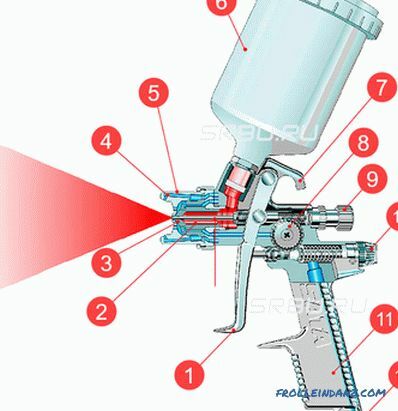 In parallel, check the overall ergonomics and weight distribution of the spray gun. In closed areas of the paint shop or directly in the paint booth, the use of electrical equipment is prohibited. There are electric devices ahead, but at the expense of the poorer quality of painting. 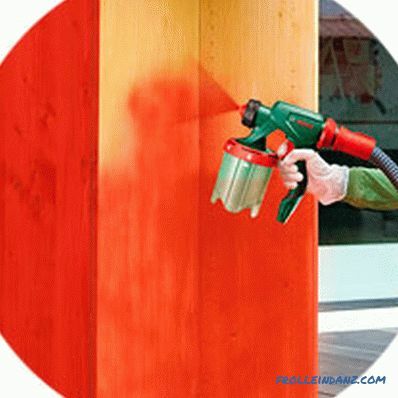 If you need an excellent result of staining, you will have to put up with the colorful mist from the pneumatic spray gun. 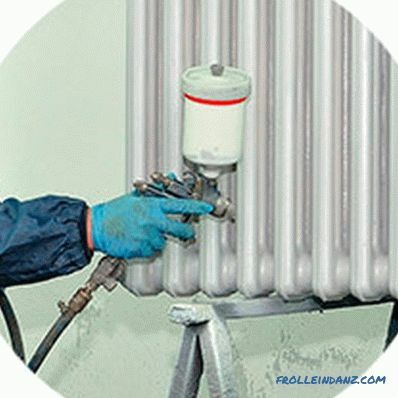 The principle of operation of the electric spray gun allows it to work with most types of paint and varnish materials, including those that have a high viscosity. At the same time, they often have nozzles with a diameter of 1.5 mm or higher, which are poorly suited for working with liquid formulations — such paints will flow and be applied unevenly. 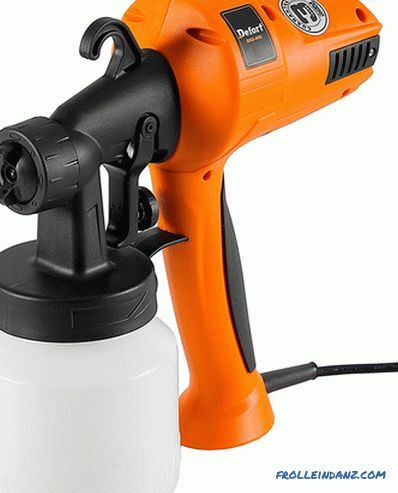 Most often, household electric spray guns have a single nozzle that cannot be replaced. This means that a particular spray gun will work with paints whose viscosity is in a certain range. You will have to always bring the paints to a certain consistency, otherwise some of them will flow, while others will clog the nozzle. 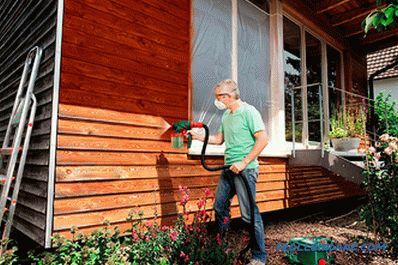 The pneumatic spray gun breaks the paint into as small particles as possible, which makes it possible to apply it in a thin layer even on surfaces of complex shape. Electrical devices in this regard are losing heavily - the paint in them is not completely broken, so the applied layer is much thicker. 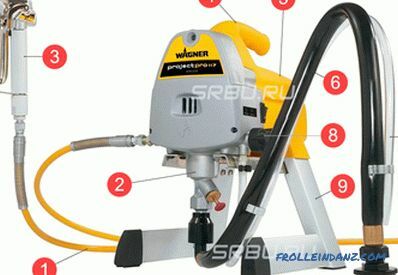 Based on the listed properties, it is clear that comparing pneumatic and electric spray guns is quite difficult - each of them will be good in its place . For home use, where there are no stringent requirements for the thickness of the paint layer and other parameters, more compact and versatile electrical devices are better suited. 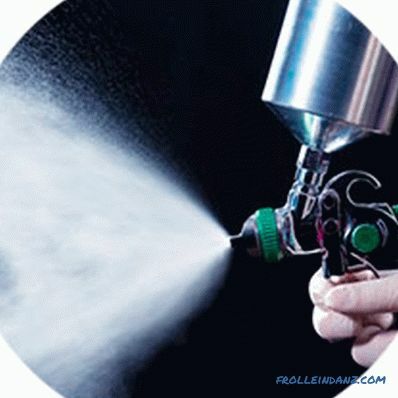 For production, it is already necessary to choose a pneumatic type spray gun with its high quality of painting. The “division of labor” is also often used, using an electric floor painting station for applying primers, and a pneumatic spray gun for final painting.